DinningBar DFence will be hosting the InterNations Official Event in February. Thank you to those regular members for your strong support. Welcome to those attending for the first time! As always, feel free to bring your friends, co-workers and relatives, but please invite them to register for InterNations first. We hope to have fun, also to take the opportunity to assist expats living in the Kobe area in need, or just exchange information. Please also come along to practice your Japanese. (guests under the age of 20 can stay until 22:00). 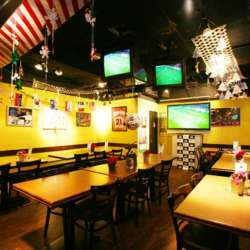 Atmosphere: Warm and friendly; very lively! Hot food and light snacks available. The venue will be reserved for our event until 21:30 so please do come along! See you soon! ＊Please note that Internations events are organised for expats and their friends to meet and socialise. They are not dating events or opportunities to promote religious organisations. Anyone involved in these activities will be asked to leave.